The latest Nibblers APK is coming with the newer version 1.18.3. Have you ever heard this game? Well, did you know? Right from the popular Angry Birds, this game was made by Rovio Entertainment Ltd. It is a new matching game with cute characters named the Nibblers which appear in the form of fishes. 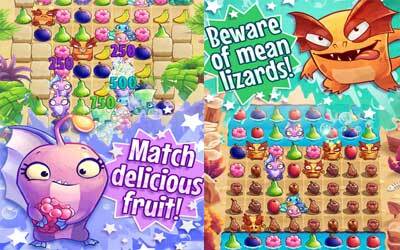 It is the kind of games which offers fresh and fruity puzzle gameplay with those fishy characters included in it to beat the obstacles and eat the fruits. The plot goes with the fishes wanting to eat yummy fruits on an island. However, it is not easy to gobble down all the fruits because there are reptilian inhabitants who are not happy with their arrival. Of course, those inhabitants will try to stop them. So, in order to get away from those pesky inhabitants and keep steady supply of fruits, you have to show their special powers in the gameplay. It is not a difficult game to play, to be honest. All you need to do is to match three or more fruits to call the Nibblers to gobble the fruits down. Make sure to use their special abilities to clear the obstacles, beat the lizards, and finally munch the fruits more. There are more than 200 levels in this game. Of course, there is new challenge waiting in each of those levels, so you can’t always take it easy to play this game. Be more careful when you are doing boss battles for there will be tougher lizards you will have to face. If you are confident enough with your matching skills in this game, you can be sure to challenge your friends in the leaderboards by connecting to Facebook. You can also see how far they have progressed through the island map. Not to mention, you can share your gifts to them. Nibblers for Android are cute and fun game you need to try. Exciting Xmas and New Year’s Bingo! Having played the first levels to the boss this is a nice variation on the theme. Keep up the good work.